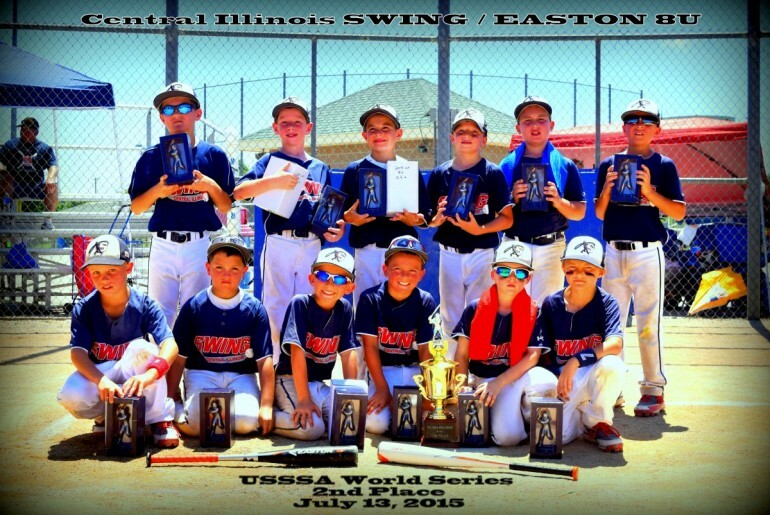 Over the weekend of July 10, the Central Illinois Swing – an 8 & Under Machine Pitch baseball team led by head coach Hayden Powers – took home second place at the United States Specialty Sports Association (USSSA) 8AA World Series, held in Lenexa, Kansas. Based out of Shipman, Illinois, the Swing is composed of twelve players from Brighton, Medora, Shipman and Greenfield, Illinois. Qualifying for the USSSA World Series after a 1st place finish in the State of Illinois Baseball Boys 8 & Under Machine Pitch AA division, the SWING advanced all the way to the 8AA World Series finals before falling to the Storm Chasers out of Olathe, Kansas. During their first year together, The SWING finished with an overall record of 26-6, outscoring their opponents 384 to 197 over the 32-game season.